Morphe 350 Palette contains 35 eyeshadow shades and offers matte aswell as shimmery finishes. The palette is a mixture of grey-toned browns to fiery sunset colours. One of my favorite pallettes, you can create amazing natural looks as well as more glam looks with the shimmers. Over all the product is excellent amazing pigments. If you looking for a warm palette this is definitely it. It has a perfect balance of matte and shimmery shades, one could easily create many different looks with this palette. 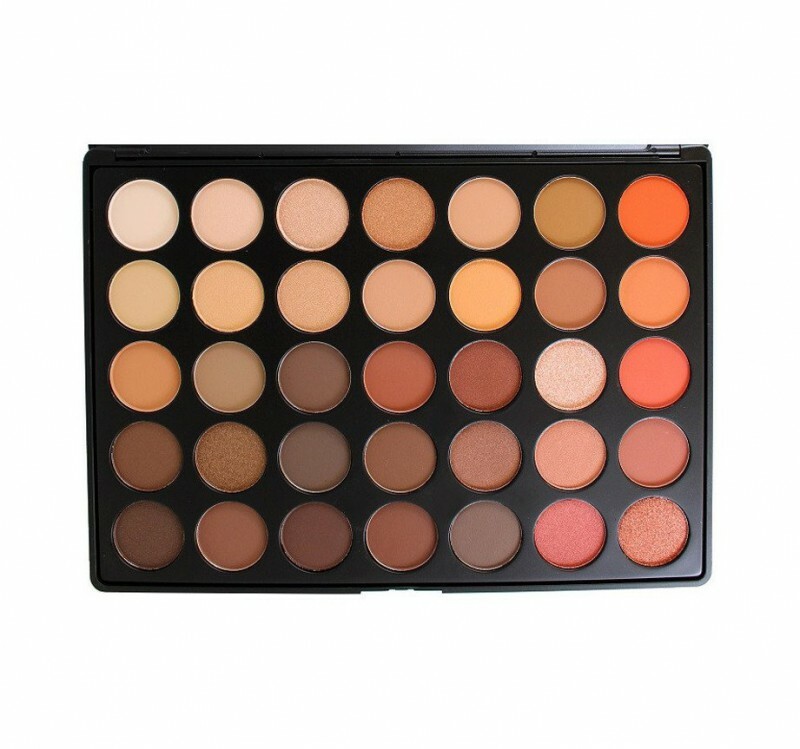 Matte morphe palette contains 35 eye shadow colors, including shimmer and matte shades. I love the mixtures of the tones and so much variety it makes me wanna try something new everyday! AHHHH! Two weeks ago I decided to order the Morphe 35O eyeshadow palette. I had heard all kinds of rave over Morphe palettes, but the brand seemed to come right out of thin air. Beauty bloggers I follow religiously began awing over the palettes. Beauty bloggers promote websites all the time that are not reliable so I was extremely skeptical. After reading a lot of good reviews of the company, I took the leap of faith to invest in my own beautiful Morphe eyeshadow palette. The second I used my palette, I felt soooo in love. When I first opened my package I did notice one thing about this palette that was different from most of my others. It was EXTREMELY basic. Just a plain black case, light weight, and no mirror. I feel like this is what drove the price for these palettes down a lot. Every time I use it I feel like I have to treat it delicately. The packaging really doesn't bother me because I don't use the mirror in eyeshadow palettes anyway and I'm not a rough monster while opening my makeup. The palette contains 35 eyeshadow colors, including shimmer and matte shades. This palette is perfect for Fall makeup looks. Upon receiving the palette I was worried that some of the colors would be difficult to see or difficult to blend, but boy was I wrong. Every color I swatched exceeded my expectations. The only thing that slightly bothered my about the shadows was that there were no names for them. When people ask me what shades I've used for my makeup I just have to respond with "oh, the color in row 5 spot 4," and it is just a little complicated, but pretty easy to get over. The shadows are very pigmented and creamy. I love the way they all swatched. Overall, I love the palette. It has found itself winning a battle between it and my other favorite shadow palettes. I have found myself using it in almost all of my daily makeup looks. The price of this palette made it even more worth it. I know I will for sure be purchasing more from the Morphe brand. i love my neutral colours it goes with everything and these shades are fantastic . The only palette you will ever desire! I absolutely am inlove with the natural colours. This Palette provides those who also like to keep it plain,simple and classy. You can always twist the styles you want to make. It is pigmentated so you dont have to worry about the dipping your brush in fix plus or water. I just LOVE this palette. I really love this palette. The colour selection is great if you are into nudes. It is also super easy to pair this palette with more colourful ones in your arsenal for alternative looks. The quality is great and the pigmentation strong. There isn't a lot of fall out and the shadows are very blendable. Some of the lighter colours do not show as prominently but the overall quality is great. Some of the colours appear vastly different in the palette but look similar upon application. This is still a great deal for someone who gets bored with duo and quad eyeshadow palettes. If you get the other Morphe pakettes as well, you will have every colour/shade ypu could ever need.